Amazon just announced that it will acquire popular smart home company Ring for a whopping $1 billion. 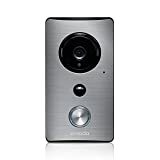 Of course, Ring is best known for its wildly popular Ring Video Doorbell, which is indeed a terrific product. But did you know that the best-selling video doorbell on Amazon is actually a different model that does the same thing for a fraction of the price? The DING WiFi Video Doorbell is available on Amazon right now for just $59.99, and it packs in all the features you need. Plus, you get 6 months of free cloud storage when you set up your account!